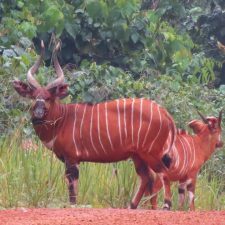 A few months ago, an English client of ours expressed an interest in hunting in Cameroon. He had been travelling for quite some time to many countries with my friend Anton Tonchev from Skopje but at that point he needed a number of specific animals from the rainforests. His collection already included 340 species of animals from around the world. Malcolm King wanted to register some more trophies from Cameroon in pursuit of the prestigious 2019 WEATHERBY AWARD.